Species’ appearance can be misleading in suggesting an ability or inability to mate. For example, even though domestic dogs (Canis lupus familiaris) display phenotypic differences, such as size, build, and coat, most dogs can interbreed and produce viable puppies that can mature and sexually reproduce ([link]). In other cases, individuals may appear similar although they are not members of the same species. For example, even though bald eagles (Haliaeetus leucocephalus) and African fish eagles (Haliaeetus vocifer) are both birds and eagles, each belongs to a separate species group ([link]). If humans were to artificially intervene and fertilize the egg of a bald eagle with the sperm of an African fish eagle and a chick did hatch, that offspring, called a hybrid (a cross between two species), would probably be infertile—unable to successfully reproduce after it reached maturity. Different species may have different genes that are active in development; therefore, it may not be possible to develop a viable offspring with two different sets of directions. Thus, even though hybridization may take place, the two species still remain separate. Populations of species share a gene pool: a collection of all the variants of genes in the species. Again, the basis to any changes in a group or population of organisms must be genetic for this is the only way to share and pass on traits. When variations occur within a species, they can only be passed to the next generation along two main pathways: asexual reproduction or sexual reproduction. The change will be passed on asexually simply if the reproducing cell possesses the changed trait. For the changed trait to be passed on by sexual reproduction, a gamete, such as a sperm or egg cell, must possess the changed trait. In other words, sexually-reproducing organisms can experience several genetic changes in their body cells, but if these changes do not occur in a sperm or egg cell, the changed trait will never reach the next generation. Only heritable traits can evolve. Therefore, reproduction plays a paramount role for genetic change to take root in a population or species. In short, organisms must be able to reproduce with each other to pass new traits to offspring. The biological definition of species, which works for sexually reproducing organisms, is a group of actually or potentially interbreeding individuals. There are exceptions to this rule. Many species are similar enough that hybrid offspring are possible and may often occur in nature, but for the majority of species this rule generally holds. In fact, the presence in nature of hybrids between similar species suggests that they may have descended from a single interbreeding species, and the speciation process may not yet be completed. Given the extraordinary diversity of life on the planet there must be mechanisms for speciation: the formation of two species from one original species. Darwin envisioned this process as a branching event and diagrammed the process in the only illustration found in On the Origin of Species ([link]a). Compare this illustration to the diagram of elephant evolution ([link]b), which shows that as one species changes over time, it branches to form more than one new species, repeatedly, as long as the population survives or until the organism becomes extinct. The only illustration in Darwin’s On the Origin of Species is (a) a diagram showing speciation events leading to biological diversity. The diagram shows similarities to phylogenetic charts that are drawn today to illustrate the relationships of species. (b) Modern elephants evolved from the Palaeomastodon, a species that lived in Egypt 35–50 million years ago. For speciation to occur, two new populations must be formed from one original population and they must evolve in such a way that it becomes impossible for individuals from the two new populations to interbreed. Biologists have proposed mechanisms by which this could occur that fall into two broad categories. Allopatric speciation (allo- = “other”; -patric = “homeland”) involves geographic separation of populations from a parent species and subsequent evolution. Sympatric speciation (sym- = “same”; -patric = “homeland”) involves speciation occurring within a parent species remaining in one location. Biologists think of speciation events as the splitting of one ancestral species into two descendant species. There is no reason why there might not be more than two species formed at one time except that it is less likely and multiple events can be conceptualized as single splits occurring close in time. A geographically continuous population has a gene pool that is relatively homogeneous. Gene flow, the movement of alleles across the range of the species, is relatively free because individuals can move and then mate with individuals in their new location. Thus, the frequency of an allele at one end of a distribution will be similar to the frequency of the allele at the other end. When populations become geographically discontinuous, that free-flow of alleles is prevented. When that separation lasts for a period of time, the two populations are able to evolve along different trajectories. Thus, their allele frequencies at numerous genetic loci gradually become more and more different as new alleles independently arise by mutation in each population. Typically, environmental conditions, such as climate, resources, predators, and competitors for the two populations will differ causing natural selection to favor divergent adaptations in each group. Isolation of populations leading to allopatric speciation can occur in a variety of ways: a river forming a new branch, erosion forming a new valley, a group of organisms traveling to a new location without the ability to return, or seeds floating over the ocean to an island. The nature of the geographic separation necessary to isolate populations depends entirely on the biology of the organism and its potential for dispersal. If two flying insect populations took up residence in separate nearby valleys, chances are, individuals from each population would fly back and forth continuing gene flow. However, if two rodent populations became divided by the formation of a new lake, continued gene flow would be unlikely; therefore, speciation would be more likely. Biologists group allopatric processes into two categories: dispersal and vicariance. Dispersal is when a few members of a species move to a new geographical area, and vicariance is when a natural situation arises to physically divide organisms. Scientists have documented numerous cases of allopatric speciation taking place. For example, along the west coast of the United States, two separate sub-species of spotted owls exist. 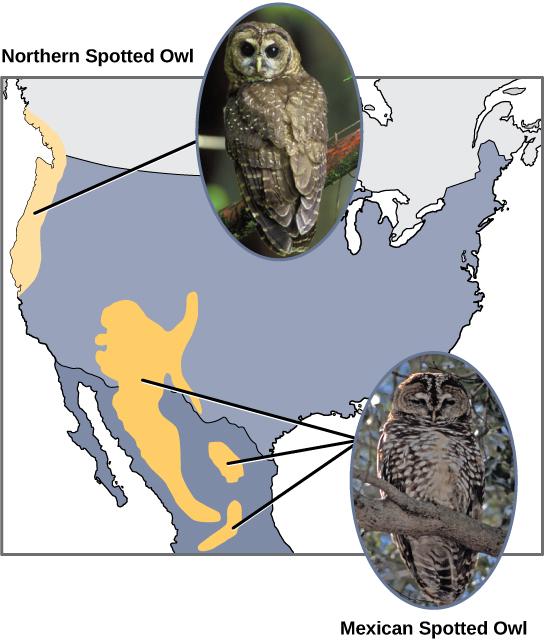 The northern spotted owl has genetic and phenotypic differences from its close relative: the Mexican spotted owl, which lives in the south ([link]). Additionally, scientists have found that the further the distance between two groups that once were the same species, the more likely it is that speciation will occur. This seems logical because as the distance increases, the various environmental factors would likely have less in common than locations in close proximity. Consider the two owls: in the north, the climate is cooler than in the south; the types of organisms in each ecosystem differ, as do their behaviors and habits; also, the hunting habits and prey choices of the southern owls vary from the northern owls. These variances can lead to evolved differences in the owls, and speciation likely will occur. In some cases, a population of one species disperses throughout an area, and each finds a distinct niche or isolated habitat. Over time, the varied demands of their new lifestyles lead to multiple speciation events originating from a single species. This is called adaptive radiation because many adaptations evolve from a single point of origin; thus, causing the species to radiate into several new ones. Island archipelagos like the Hawaiian Islands provide an ideal context for adaptive radiation events because water surrounds each island which leads to geographical isolation for many organisms. The Hawaiian honeycreeper illustrates one example of adaptive radiation. From a single species, called the founder species, numerous species have evolved, including the six shown in [link]. 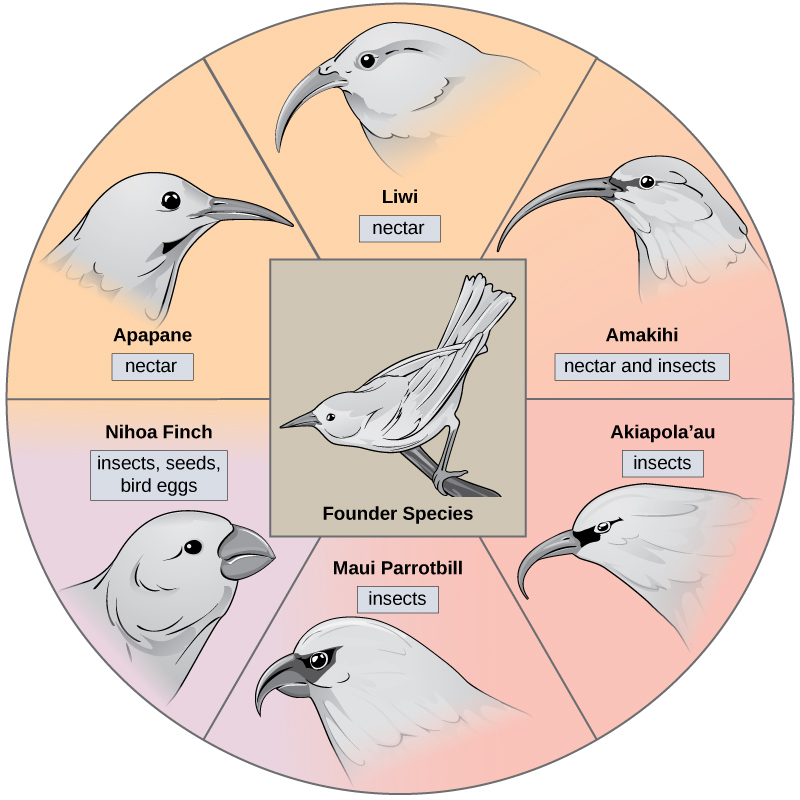 The honeycreeper birds illustrate adaptive radiation. From one original species of bird, multiple others evolved, each with its own distinctive characteristics. Notice the differences in the species’ beaks in [link]. Evolution in response to natural selection based on specific food sources in each new habitat led to evolution of a different beak suited to the specific food source. The seed-eating bird has a thicker, stronger beak which is suited to break hard nuts. The nectar-eating birds have long beaks to dip into flowers to reach the nectar. The insect-eating birds have beaks like swords, appropriate for stabbing and impaling insects. Darwin’s finches are another example of adaptive radiation in an archipelago. Click through this interactive site to see how island birds evolved in evolutionary increments from 5 million years ago to today. Can divergence occur if no physical barriers are in place to separate individuals who continue to live and reproduce in the same habitat? The answer is yes. The process of speciation within the same space is called sympatric speciation; the prefix “sym” means same, so “sympatric” means “same homeland” in contrast to “allopatric” meaning “other homeland.” A number of mechanisms for sympatric speciation have been proposed and studied. One form of sympatric speciation can begin with a serious chromosomal error during cell division. 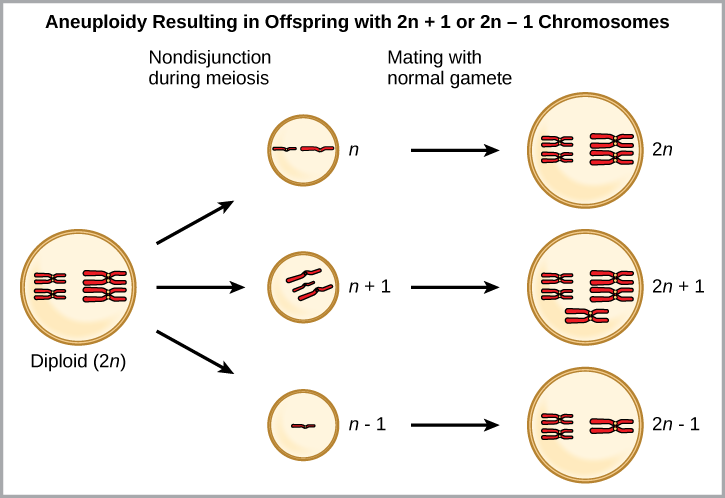 In a normal cell division event chromosomes replicate, pair up, and then separate so that each new cell has the same number of chromosomes. However, sometimes the pairs separate and the end cell product has too many or too few individual chromosomes in a condition called aneuploidy ([link]). Which is most likely to survive, offspring with 2n+1 chromosomes or offspring with 2n-1 chromosomes? Polyploidy is a condition in which a cell or organism has an extra set, or sets, of chromosomes. Scientists have identified two main types of polyploidy that can lead to reproductive isolation of an individual in the polyploidy state. Reproductive isolation is the inability to interbreed. In some cases, a polyploid individual will have two or more complete sets of chromosomes from its own species in a condition called autopolyploidy ([link]). The prefix “auto-” means “self,” so the term means multiple chromosomes from one’s own species. Polyploidy results from an error in meiosis in which all of the chromosomes move into one cell instead of separating. Autopolyploidy results when mitosis is not followed by cytokinesis. For example, if a plant species with 2n = 6 produces autopolyploid gametes that are also diploid (2n = 6, when they should be n = 3), the gametes now have twice as many chromosomes as they should have. These new gametes will be incompatible with the normal gametes produced by this plant species. However, they could either self-pollinate or reproduce with other autopolyploid plants with gametes having the same diploid number. In this way, sympatric speciation can occur quickly by forming offspring with 4n called a tetraploid. These individuals would immediately be able to reproduce only with those of this new kind and not those of the ancestral species. The other form of polyploidy occurs when individuals of two different species reproduce to form a viable offspring called an allopolyploid. The prefix “allo-” means “other” (recall from allopatric): therefore, an allopolyploid occurs when gametes from two different species combine. [link] illustrates one possible way an allopolyploid can form. Notice how it takes two generations, or two reproductive acts, before the viable fertile hybrid results. Alloploidy results when two species mate to produce viable offspring. 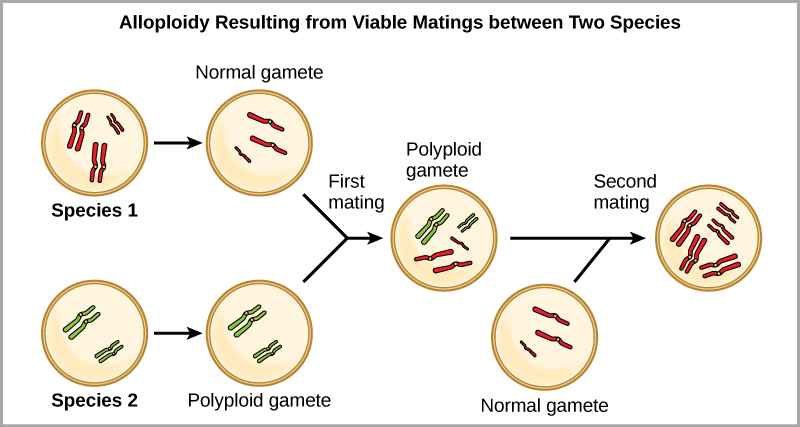 In the example shown, a normal gamete from one species fuses with a polyploidy gamete from another. Two matings are necessary to produce viable offspring. The cultivated forms of wheat, cotton, and tobacco plants are all allopolyploids. Although polyploidy occurs occasionally in animals, it takes place most commonly in plants. (Animals with any of the types of chromosomal aberrations described here are unlikely to survive and produce normal offspring.) Scientists have discovered more than half of all plant species studied relate back to a species evolved through polyploidy. With such a high rate of polyploidy in plants, some scientists hypothesize that this mechanism takes place more as an adaptation than as an error. Given enough time, the genetic and phenotypic divergence between populations will affect characters that influence reproduction: if individuals of the two populations were to be brought together, mating would be less likely, but if mating occurred, offspring would be non-viable or infertile. Many types of diverging characters may affect the reproductive isolation, the ability to interbreed, of the two populations. Reproductive isolation can take place in a variety of ways. Scientists organize them into two groups: prezygotic barriers and postzygotic barriers. Recall that a zygote is a fertilized egg: the first cell of the development of an organism that reproduces sexually. Therefore, a prezygotic barrier is a mechanism that blocks reproduction from taking place; this includes barriers that prevent fertilization when organisms attempt reproduction. A postzygotic barrier occurs after zygote formation; this includes organisms that don’t survive the embryonic stage and those that are born sterile. Some types of prezygotic barriers prevent reproduction entirely. Many organisms only reproduce at certain times of the year, often just annually. Differences in breeding schedules, called temporal isolation, can act as a form of reproductive isolation. For example, two species of frogs inhabit the same area, but one reproduces from January to March, whereas the other reproduces from March to May ([link]). In some cases, populations of a species move or are moved to a new habitat and take up residence in a place that no longer overlaps with the other populations of the same species. This situation is called habitat isolation. Reproduction with the parent species ceases, and a new group exists that is now reproductively and genetically independent. For example, a cricket population that was divided after a flood could no longer interact with each other. Over time, the forces of natural selection, mutation, and genetic drift will likely result in the divergence of the two groups ([link]). Speciation can occur when two populations occupy different habitats. The habitats need not be far apart. The cricket (a) Gryllus pennsylvanicus prefers sandy soil, and the cricket (b) Gryllus firmus prefers loamy soil. The two species can live in close proximity, but because of their different soil preferences, they became genetically isolated. Behavioral isolation occurs when the presence or absence of a specific behavior prevents reproduction from taking place. For example, male fireflies use specific light patterns to attract females. Various species of fireflies display their lights differently. If a male of one species tried to attract the female of another, she would not recognize the light pattern and would not mate with the male. Other prezygotic barriers work when differences in their gamete cells (eggs and sperm) prevent fertilization from taking place; this is called a gametic barrier. Similarly, in some cases closely related organisms try to mate, but their reproductive structures simply do not fit together. For example, damselfly males of different species have differently shaped reproductive organs. If one species tries to mate with the female of another, their body parts simply do not fit together. ([link]). The shape of the male reproductive organ varies among male damselfly species, and is only compatible with the female of that species. Reproductive organ incompatibility keeps the species reproductively isolated. In plants, certain structures aimed to attract one type of pollinator simultaneously prevent a different pollinator from accessing the pollen. The tunnel through which an animal must access nectar can vary widely in length and diameter, which prevents the plant from being cross-pollinated with a different species ([link]). Some flowers have evolved to attract certain pollinators. The (a) wide foxglove flower is adapted for pollination by bees, while the (b) long, tube-shaped trumpet creeper flower is adapted for pollination by humming birds. When fertilization takes place and a zygote forms, postzygotic barriers can prevent reproduction. Hybrid individuals in many cases cannot form normally in the womb and simply do not survive past the embryonic stages. This is called hybrid inviability because the hybrid organisms simply are not viable. In another postzygotic situation, reproduction leads to the birth and growth of a hybrid that is sterile and unable to reproduce offspring of their own; this is called hybrid sterility. Sympatric speciation may also take place in ways other than polyploidy. For example, consider a species of fish that lives in a lake. As the population grows, competition for food also grows. Under pressure to find food, suppose that a group of these fish had the genetic flexibility to discover and feed off another resource that was unused by the other fish. What if this new food source was found at a different depth of the lake? Over time, those feeding on the second food source would interact more with each other than the other fish; therefore, they would breed together as well. Offspring of these fish would likely behave as their parents: feeding and living in the same area and keeping separate from the original population. If this group of fish continued to remain separate from the first population, eventually sympatric speciation might occur as more genetic differences accumulated between them. This scenario does play out in nature, as do others that lead to reproductive isolation. One such place is Lake Victoria in Africa, famous for its sympatric speciation of cichlid fish. Researchers have found hundreds of sympatric speciation events in these fish, which have not only happened in great number, but also over a short period of time. [link] shows this type of speciation among a cichlid fish population in Nicaragua. In this locale, two types of cichlids live in the same geographic location but have come to have different morphologies that allow them to eat various food sources. Cichlid fish from Lake Apoyeque, Nicaragua, show evidence of sympatric speciation. Lake Apoyeque, a crater lake, is 1800 years old, but genetic evidence indicates that the lake was populated only 100 years ago by a single population of cichlid fish. Nevertheless, two populations with distinct morphologies and diets now exist in the lake, and scientists believe these populations may be in an early stage of speciation. Speciation occurs along two main pathways: geographic separation (allopatric speciation) and through mechanisms that occur within a shared habitat (sympatric speciation). Both pathways isolate a population reproductively in some form. Mechanisms of reproductive isolation act as barriers between closely related species, enabling them to diverge and exist as genetically independent species. Prezygotic barriers block reproduction prior to formation of a zygote, whereas postzygotic barriers block reproduction after fertilization occurs. For a new species to develop, something must cause a breach in the reproductive barriers. Sympatric speciation can occur through errors in meiosis that form gametes with extra chromosomes (polyploidy). Autopolyploidy occurs within a single species, whereas allopolyploidy occurs between closely related species. [link] Which is most likely to survive, offspring with 2n+1 chromosomes or offspring with 2n-1 chromosomes? [link] Loss of genetic material is almost always lethal, so offspring with 2n+1 chromosomes are more likely to survive. Which situation would most likely lead to allopatric speciation? flood causes the formation of a new lake. A storm causes several large trees to fall down. A mutation causes a new trait to develop. An injury causes an organism to seek out a new food source. What is the main difference between dispersal and vicariance? One leads to allopatric speciation, whereas the other leads to sympatric speciation. One involves the movement of the organism, and the other involves a change in the environment. One depends on a genetic mutation occurring, and the other does not. One involves closely related organisms, and the other involves only individuals of the same species. Which variable increases the likelihood of allopatric speciation taking place more quickly? What is the main difference between autopolyploid and allopolyploid? Which reproductive combination produces hybrids? Which condition is the basis for a species to be reproductively isolated from other members? It does not share its habitat with related species. It does not exist out of a single habitat. It does not exchange genetic information with other species. It does not undergo evolutionary changes for a significant period of time. Which situation is not an example of a prezygotic barrier? Two species of turtles breed at different times of the year. Two species of flowers attract different pollinators. Two species of birds display different mating dances. Two species of insects produce infertile offspring. Why do island chains provide ideal conditions for adaptive radiation to occur? Organisms of one species can arrive to an island together and then disperse throughout the chain, each settling into different niches and exploiting different food resources to reduce competition. Two species of fish had recently undergone sympatric speciation. The males of each species had a different coloring through which the females could identify and choose a partner from her own species. After some time, pollution made the lake so cloudy that it was hard for females to distinguish colors. What might take place in this situation? It is likely the two species would start to reproduce with each other. Depending on the viability of their offspring, they may fuse back into one species. Why can polyploidy individuals lead to speciation fairly quickly? The formation of gametes with new n numbers can occur in one generation. After a couple of generations, enough of these new hybrids can form to reproduce together as a new species. 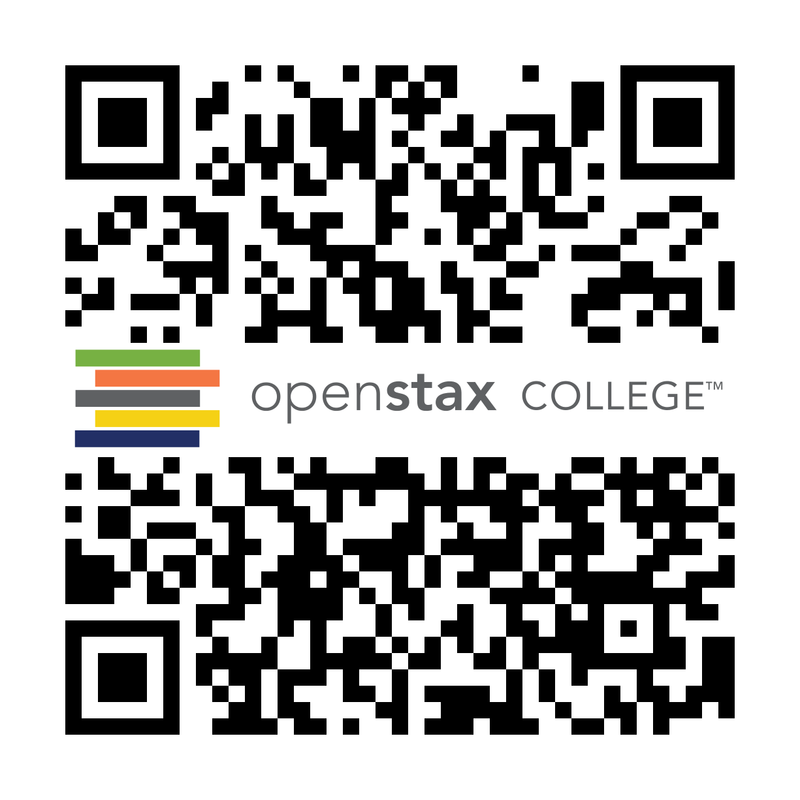 Formation of New Species by OpenStaxCollege is licensed under a Creative Commons Attribution 4.0 International License, except where otherwise noted.